The legacy of Bob Moog lives on in the work of musicians who worked closely with him. One such iconic artist is Roger Powell, longtime synthesizer artist, programmer, and member of Todd Rundgrens progressive rock band, Utopia (1974-86; 1992). Last year, Powell announced his donation of a unique, Moog-designed keyboard controller to the Bob Moog Foundation. This is a historic donation of a historic device  and boy does this instrument have a history. If you weren’t lucky enough to experience Roger’s musical work in the 70s and 80s, you simply may not know of him. He is one of the great keyboard players and pioneers from the early days of rock synthesis. Powell learned synthesizer basics in the early 1970s while working at a recording studio. His first job in the synthesizer business was that of a demonstrator for ARP, one of Moogs earliest rivals. A fantastic example of Powells work demonstrating the ARP Odyssey can be found at the link http://vimeo.com/34240890, where he walks through the operation of the synthesizer. Among his musical accomplishments from this period was the solo album, Cosmic Furnace (1973), the record that sold me on ARP synthesizers. Ironcially, ARP let Roger go in 1973 because he “wasn’t selling enough” as a representative of their instruments. But Roger wasnt without a synthesizer connection for long. 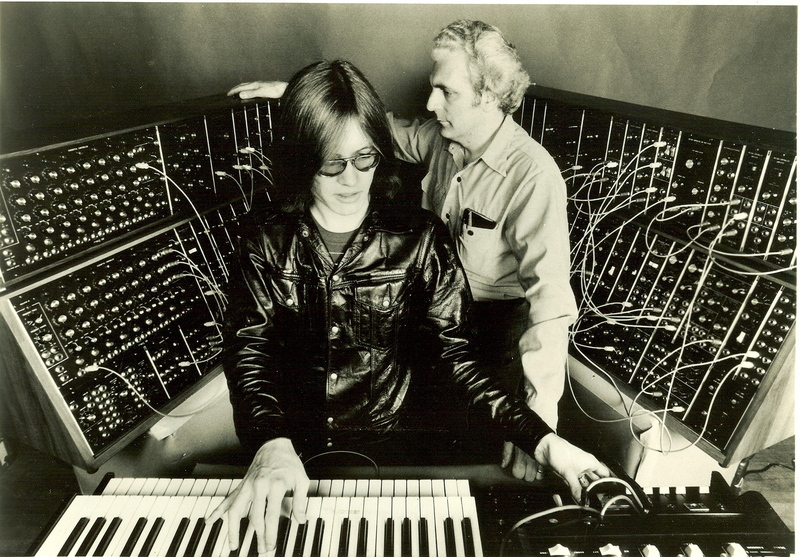 About the same time he joined Rundgrens band in 1974, he struck a deal to represent Moog Music, then a part of Norlin Music Corp. Norlin appreciated Roger’s know-how as a synthesist and engineer and budgeted $12,000 to build Roger a supersynth to use in demonstrations, performances, and recording. The guts of the supersynth comprised two Moog Modular System 55 units, the largest modular system Moog manufactured at that time. But Roger needed a specialized controller keyboard to meet his specific needs, so Norlin sent their best custom designer to assist in the process-Bob Moog himself. See the controller in action in this YouTube video. Two keyboard manuals, allowing independent patches on the two modular synthesizers to be played at the same time. Individual scale, range, portamento settings, and portamento switches were installed for each manual. These could set for each keyboard individually, or combined to control both keyboards at the same time. A built-in mixer section with four faders, to manage the sound of the two synths. This custom Bob Moog-designed mixer allowed Roger to easily manage the loudness of various patches and effects he was using in a live setting. A volume control for the Echoplex delay unit Roger used with the system. A VU meter for measuring the relative amplitude of the synthesizer output. A headphone jack, headphone volume, and output on/off switch that allowed Roger to preview tuning and patch changes before making them audible to the audience. Two “accessory” ports for a Ribbon Controller and a standalone Sample/Hold module. The keyboard module interfaced with the modular systems through a special cable and connector port. This cable carried the control voltages from the two manuals, accessories, and modulation/pitch wheels and distributed them to the proper synthesizer modules. The cable also had several tracks of audio return which came back into the keyboard from the audio output of the modular; their loudness was individually controlled by the Bob Moog custom-designed mixer. The total output of the synthesizer, came out of the systems Line Level Out XLR jack. Add Rogers name next to a very large Moog logo to the back of the controller to satisfy the Norlin marketing machine, and bang: one incredible controller. 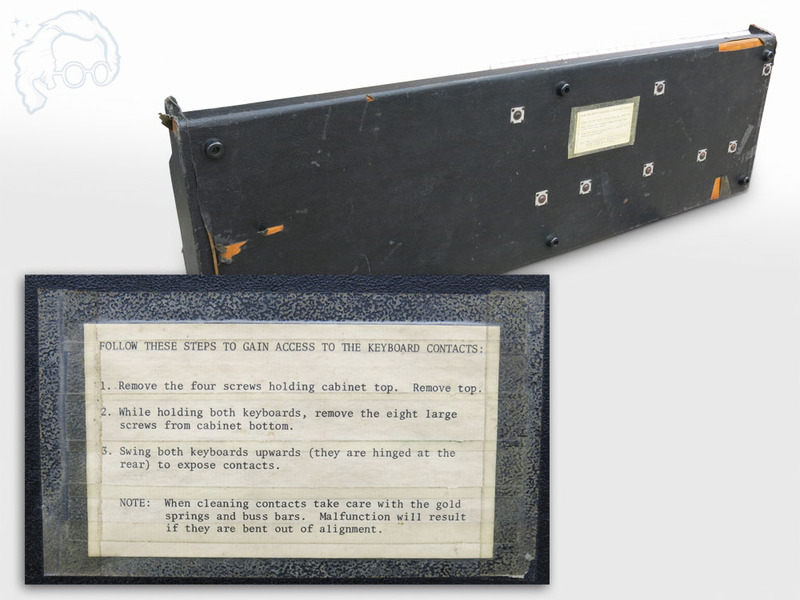 On the bottom of the unit, there is a taped set of instructions about cleaning key contacts. This set of instructions is original, and Roger believes it came from the Moog factory. It’s no easy task to perform live with a modular, but Roger used this system and its custom controller on tour with Utopia and in his own work. The system was used extensively in the creation of Todd Rundgren’s album Initiation (1975) on the track “A Treatise on Cosmic Fire.” Todd had Roger program a large variety of sounds and textures over the course of several days which Todd later edited and arranged for the recording. Here’s where the story gets crazy. In the late 70s, Utopia had a two-night show in Cleveland. Their music equipment was left on the stage after the first night for use the second night. At some point during the night, someone stole the custom keyboard controller, but left the large modular units intact. Rogers theory is that the thief must have thought that the keyboard controller itself was playable, confusing it for a small, standalone synthesizer or organ. But in fact, the controller made no sounds on its own. 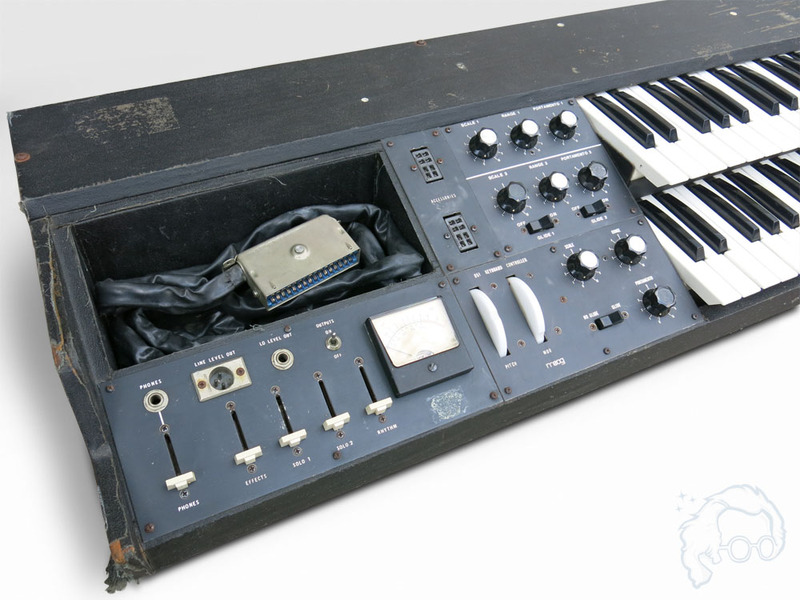 The thief walked away with an interesting custom-designed Bob Moog original, but one that was useless without the modular units. After the disappearance of the controller, a number of calamities befell the two companion System 55s. In one instance, in a New York studio, a ceiling collapse led to the synthesizers being drenched in rainwater. At another point, overzealous, partying roadies sprayed whipped-cream onto the control panels of the modulars. Even though rain, cream, sugar, and general gooeyness are terrible for electronic knobs and jacks, the modulars amazingly survived these first two calamities. The third calamity was too much, however, after an arsonist lit up the warehouse where Utopia practiced, reducing the space to rubble in an explosion. Everything inside was destroyed, including Roger’s $12,000 Moog promotional modular system. But that’s not the end of the story. In 2002, Roger got a call from his friend Dominic Milano, former editor of Keyboard magazine. Dominic had just seen something that looked suspiciously like the Powell controller on eBay. Roger checked it out, and sure enough, the controller had resurfaced. Interestingly, the person listing the stolen controller on eBay was not the apparent thief of long ago, and Roger was able to negotiate its return. One of the only apparent changes to the unit had been the removal of Rogers name that once appeared next to the prominent Moog logo. The funny thing is, had the controller not been stolen, it may have been destroyed in the same fire that ruined the modular units. Roger was most recently a programmer working in the offices of Apple Computer. Once reunited with the lost controller, he proudly put the keyboard controller on display in his office at Apple. Roger recently sent the controller on its final journey to the Bob Moog Foundation. Given its history, Roger wondered what calamity might befall the controller on its final trek. 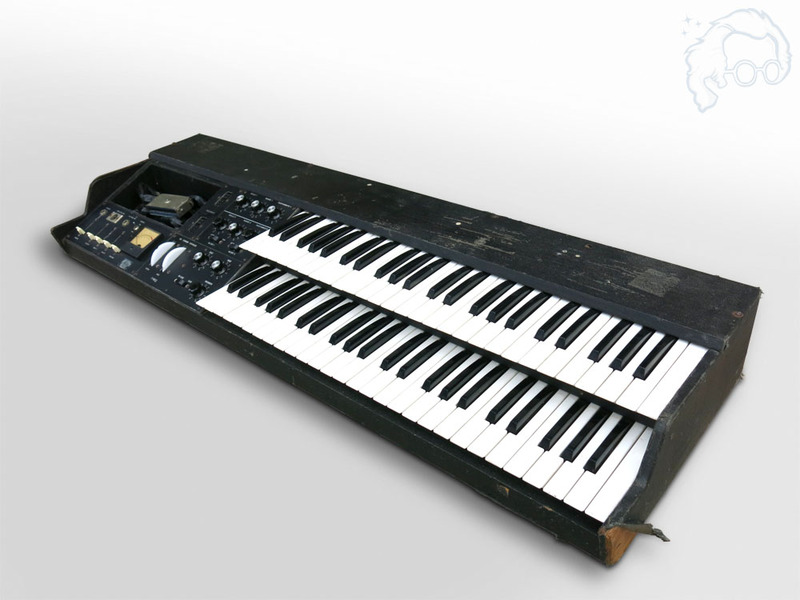 Fortunately, this piece of synthesizer history has a happy ending. The controller arrived safelyand extremely well-packedat the Bob Moog Foundation, where it now has a place of honor in the archives. Wed like to thank Roger for this generous gift that will help further the legacy of Bob Moog. Moog Music had some pretty iconic photographs taken of Bob, Roger, and the system in the ’70’s. The two System 55s are plainly visible, as well as the keys from the controller. A Moog Sample and Hold unit and a Ribbon fit atop the controller. I love such great stories, thanks! The VU meter is a neat usability feature that I’m surprised isn’t seen on modern MIDI controllers (or none that I’m aware of, at least). Is it still usable as a controller? I mean, is it putting out voltages? Do you guys plan to restore it and make it playable? BTW, he was a great guy! What a great story! I have always been a big Roger Powell fan. His donation of the controller truly displays his character and love for Bob Moog and his contributions to our world. I believe that Willie Wilcox’s Motorcycle drum kit was also destroyed in the fire that took the two modulars. Roger Powell a synthesizer legend and a nice guy. As a MimiMoog assembler in the Williamsville plant in Buffalo, I met many of these people and have great stories – but since we’re talking one-offs here, let me report that THESE WAS A DIGITAL GRAND PIANO being created in a small back room near my assembly station! I heard it being played by Keith Emerson, Bob and Hod knows who else and I snuck in the room and played it myself with my co-worker Dan Little. This thing sounded more like a grand piano that ANY device created up until a few years ago and I wonder what happened to it. I have written Michelle about this, but since she has no knowledge, I thought I would post it here ….